Evernote Destroys The Old Skitch With New 2.0 "Update"
The time has finally arrived: it's November's NaBloPoMo, the birthday of this blogging project. Let's get this blogging party started. November is the only month that doesn't have a separate theme. Instead, the theme for November is blogging for blogging's sake. So I will consider this my personal challenge - can I keep up the pace and have daily posts coming out here throughout November? It might have been better to perhaps give my danyork.me site as the address, as that aggregates content across all the sites where I write, but hey, why not do the challenge for this individual site, particularly given that I wrote zero posts here in October 2012! 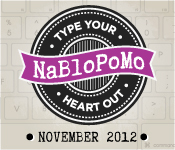 Want to join in to the November 2012 write-a-thon? There's still time to sign up until November 5th.